A further 69 lots of his Star Wars memorabilia sold for a combined total of £23,796 at Vectis Toy Auctioneers in Stockton, Teesside. 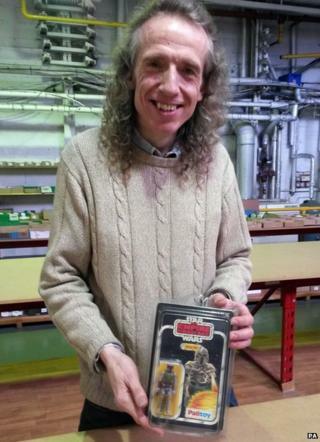 Mr Stevens, who still has some 10,000 items in his collection, said: "I was one of the children who queued up to see Star Wars when it was first released in 1977 and it had a tremendous effect on me. "I began collecting everything that I could get my hands on connected to Star Wars and I have kept going right up to the present day." The Boba Fett figure, made by Palitoy, is thought to be one of only four or five to exist in such pristine condition. Mr Stevens described it as "a wrench" to sell, but said he wanted to raise the cash for a new house. He said: "You think to yourself, 'I'm in a [rented] flat and I have got a box of figures worth as much as a house'. He said he hoped the figure, acquired by an anonymous buyer who bid over the internet, had gone to "a good collector who will look after it and cherish it like I have". Valuer Kathy Taylor said: "We do get a lot of toys here which make big money, but this is the first Star Wars collection that we have ever had that is of this calibre."